In a medium sized saucepan place the stick of butter over low heat and let melt. In the meantime, in medium sized bowl, add the flour, baking powder and salt. Stir dry ingredients with fork or whisk to incorporate. After you’ve done that, the butter will probably still not be melted. 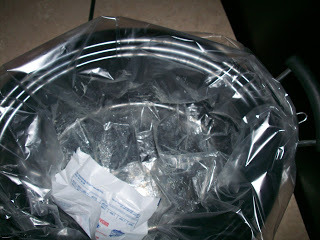 This is when you want to place a crock pot liner or piece of parchment paper into the bottom of a 6 quart crock pot. I only had the liners, so that’s what I used. I actually used the butter wrapper to grease the liner too (why use non-stick spray when there was still butter on the wrapper that would have just gotten thrown away, right?). Also, since the mixture is going to be a little warm when you add it to the crock pot you want to go ahead and turn it on and place the lid on top. My crock pot had a warm setting, so that’s what I turned it to. If yours only has low and high, low should be fine too. Add the flour mixture to the wet mix in two different batches. I did it half and half. After incorporating the first half so that I could see no more white from the flour, I then added the second half and did the same thing. 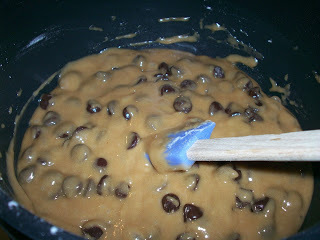 Stir in the cup of chocolate chips until they are evenly distributed. 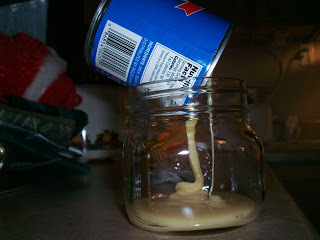 Pour the entire mixture into the crock pot and spread it out as evenly as possible. 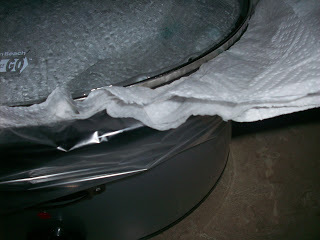 Take 5 or 6 paper towels and fold them so they will fit on top of the crock pot and the lid will securely hold them. 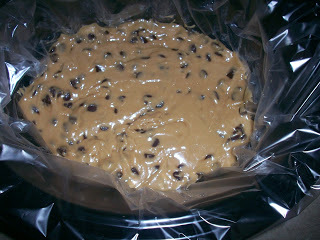 The paper towels will catch all the condensation instead of it making your blondies watery. Cook on low for 3 hours. You will be tempted to peak, but please refrain! After three hours, turn the crock pot off and remove the crockery part out of the base. Let it sit for an additional 30 minutes. Now, and only now, remove the liner and blondie from the crockery. 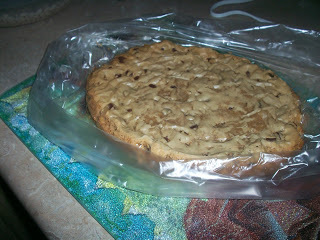 Let the chocolate chip blondie continue to cool for an additional 30 minutes before cutting. The edges should be golden in color. The center of it will appear to be gooey, but it will set up the longer you let it sit. Whatever you do…. DO NOT CONTINUE TO COOK IT IN THE CROCK POT TO HELP IT TO SET UP!!! You will end up with a brick instead of a delicious dessert. This turned out to be very flakey on top, soft in the middle and firm around the edges. Exactly what you would expect if you had cooked it in the oven. 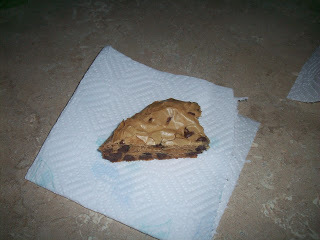 (Minus the football shape due to my crock pot being oval in shape). 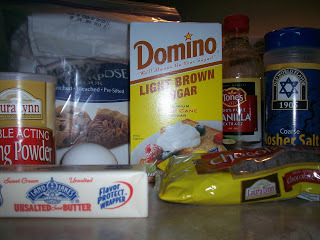 See Crock Pot Chocolate Chip Blondies on Key Ingredient. 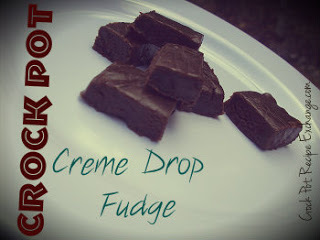 This recipe shared at Gooseberry Patch Recipe Roundup, Tempt My Tummy Tuesday, Potluck Sunday, Recipe Swap Sunday, Friday Potluck at EKat’s Kitchen, Fat Camp Friday, GCC, Sweet Tooth Friday, Leiter Frau Guten Tag, Foodie Fridays, Recipe Swap Thursday, Tasty Traditions and Full Plate Thursday.